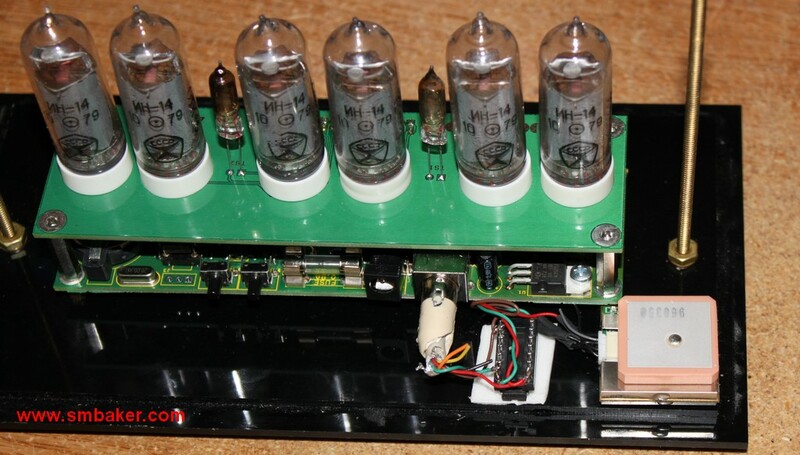 This is a product review of the TubeHobby NCV2.1-14 Nixie Tube Clock Kit. 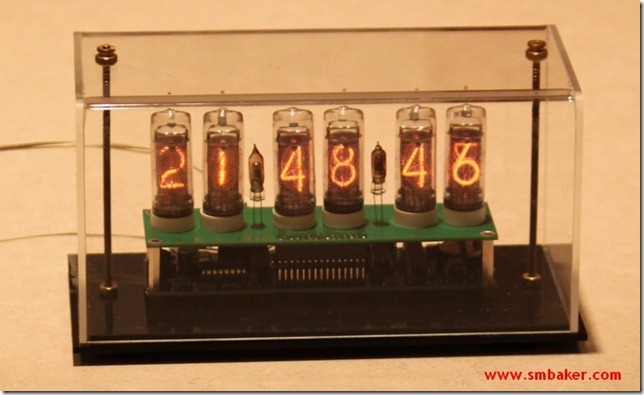 For those unfamiliar with nixie tubes, they are a technology that dates from the 1960s. Nixies are glass gas-filled tubes operating on approximately 170 volts DC. Each tube has 10 cathodes, one for each of the numerals 0-9 and one anode. 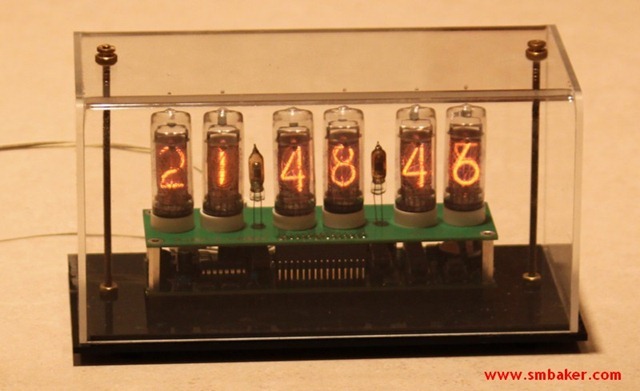 Whereas nixie tubes are rarely seen today, they bring back a nostalgic feel of early electronic technology. The kit I purchased is called the NCV2.1-14. It uses the IN-14 tube, which is a common and fairly cheap russian tube. The kit is also available in an IN-18 variant using much larger (and much more expensive tubes). Everything is included in the kit except a case; you’ll have to purchase a case yourself. The case I purchased is a “trophy case” from an online trophy case retailer. The kit was easy to construct using through-hole components, no SMT to worry about. It does of course require a great deal of soldering, but nothing so complex that the amateur should not be able to do it. I found the hardest part was installing the tubes themselves as there are a lot of little wires that have to be threaded through holes in the PCB. Make sure the tubes are straight and true before soldering. One of the advantages of this clock is that it includes an RS232 serial input where you can connect a GPS receiver. Connecting a GPS will ensure your clock is always accurate. There are many cheap GPS units available, check ebay. I decided to GPS-enable the clock. My first attempt used an ancient Deluo GM-305 GPS from the junk pile. It worked, but it didn’t work well. It took a long time to acquire the signal, had trouble receiving the signal through walls, and was just plain too large to mount inside the clock enclosure. Also have a look at Scott’s Nixie Clock, a shareware program that can display a replica nixie tube clock on your computer screen.